You'll be £9.00 closer to your next £10.00 credit when you purchase Wellington's Worst Scrape. What's this? The disastrous retreat and near disintegration of Sir John Moore's army on the road to Corunna in 1809 is traditionally regarded as the low point in the history of the British intervention in the Peninsular War. Yet under the Duke of Wellington the British and their allies suffered defeats and retreats that tend to be overshadowed by the series of victories that eventually drove the French from Portugal and Spain. None of these setbacks was graver than the retreat that followed the disastrous failure of the siege of Burgos in 1812. It is this, less than glorious, phase of the Peninsular campaign that is the subject of Carole Divall's latest study of the British army of the Napoleonic Wars. By reconstructing events in close detail, and by bringing together [many] primary sources, she gives a vivid account of what happened and why. Wellington himself recognized the mistakes and miscalculations that led to the potentially catastrophic situation in which he placed his men. He described it as his 'worst scrape'. Yet most of the letters, journals and memoirs that have survived praise the skill with which he saved Britain's only army from disaster. Carole Divall weaves together Wellington's despatches with the eyewitness testimony left by British and Portuguese officers and men, by civilians, and by the French. A fascinating, multi-layered impression emerges of the siege of Burgos itself and the sequence of manoeuvres that preceded it. She describes in authentic detail the tense decision-making and the misjudgements that were made on the allied side and the headlong retreat that followed as the British fled from two French armies that threatened to trap and destroy them. Carole Divall's in-depth study of a pivotal – and neglected – episode in the Peninsular War gives a fascinating insight into the character of the fighting, at every level, and into the strengths and weaknesses of Wellington's command. [Divall] has written an excellent history of the campaign, as seen not by the commanders, but by the junior officers and men who fought there. She quotes extensively from almost 50 sets of memoirs, letters, and diaries to bring to life the experiences of the soldiers who fought on both sides. Many sources were written shortly after the events and there is a sense of immediacy that draws the reader into the action. Ms. Divall does not just use British sources, but also French ones. Among them are numerous quotes from Captain Hippolyte d’Espinchal of the 2nd French Hussars, who was actively involved in many of the key events of the pursuit of the British. As would be expected, the description of the events as seen by a French writer who witnessed it was often different than by a British soldier who was there. The author tries to stay neutral and gives both sides’ perspective when describing the events. If there was a contradiction, she makes an effort to reconcile the differences. Wellington acknowledged the military mistakes that had been made and described the retreat as his 'worst scrape'. And that's the comment that Napoleonic Wars' specialist Carole Divall had taken for the title of this latest book. This is Carole Divall’s third book, the first two having dealt in detail with the 30th Regiment, and this time she concentrate’s on the latter stages of Wellington’s campaign of 1812, from his advance from Madrid on Burgos and his subsequent retreat. Using letters and memoirs from participants on both the British and French sides Carole paints a vivid picture of this pivotal campaign, one where Wellington showed what the British forces could do, but also showed it at its worst during the retreat. It led ultimately to the successful campaign of 1813 and the French being pushed out of Spain. Carole has presented in this book part of a campaign which has been largely overshadowed by Wellington’s victories at Salamanca and Vittoria. This is an excellent book that fills a gap in the usual telling of the war in Spain and Portugal and one worth having for anyone interested in the war in Spain. An English teacher with a special interest in military history, particularly that of the British Army during the Napoleonic Wars, Divall has become an expert on regimental history, the workings of Wellington’s army and aspects of the key campaigns. In Wellington’s Worst Scrape, she reconstructs the series of extraordinary events in close detail and brings together many primary sources, creating a vivid and enthralling account of what happened and why. Divall weaves together Wellington’s despatches with the eyewitness testimonies of British and Portuguese officers and men, civilians and the French. The result is a fascinating, multi-layered impression of the siege of Burgos itself and the sequence of manoeuvres that preceded it. Using authentic detail, she describes the tense decision-making, the allied misjudgements and the headlong retreat that followed as the British fled from two French armies which threatened to trap and destroy them. 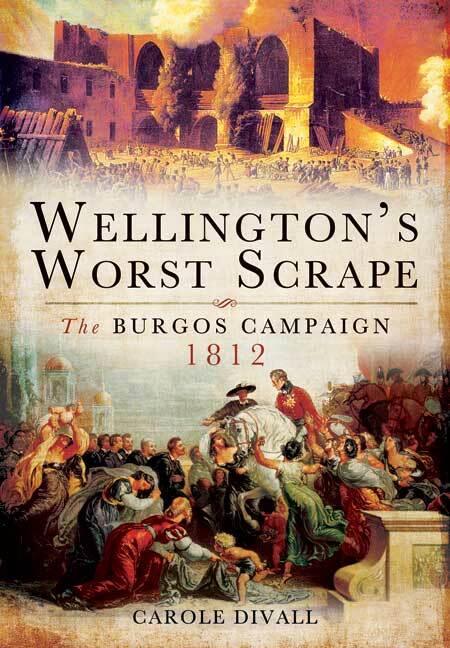 Wellington’s Worst Scrape provides an illuminating and exciting in-depth study of a pivotal and neglected episode in the tough Peninsular War as well an immaculately researched insight into the character of the fighting at every level, and into the strengths and weaknesses of Wellington’s command. A welcome and erudite addition to the forgotten pages of British military history. Carole Divall has a special interest in military history, in particular the history of the British army during the Napoleonic Wars. She has published articles on regimental history, on the workings of the army of Wellington’s time and on aspects of the key campaigns. Her most recent publications are Redcoats Against Napoleon and Inside the Regiment, two studies of the officers and men of the 30th Regiment during the Revolutionary and Napoleonic Wars.